Founded in 1993, Interactive Sites is the leading web development firm for the global hospitality industry, providing website design and web-based applications to many of the world's most prestigious hotel brands. Interactive Sites is a fast-paced, entrepreneurial-minded firm that seeks individuals that succeed in an intense and growing atmosphere. We are customer centric! Born out of the hospitality industry, we understand what good customer service really is. We have been working exclusively in the hospitality industry since 1994. We know what it takes to make a hotel succeed online. Our technology changes with the invention of newer, better technologies. 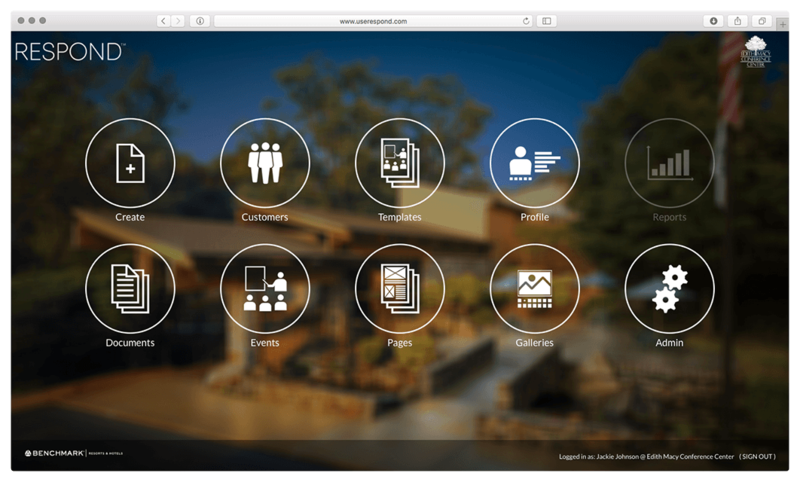 Our HandsOn™ CMS allows for hoteliers to have full control over their site. Our skilled team of developers can integrate into most platforms and can help clients leverage their prior investment into existing technology. Creating a sense of arrival for the guest is our #1 design priority. Your website has to present well online, no questions asked. We provide a holistic SEO approach in order to maximize results. Our goal is to increase direct online bookings, shifting revenue from the OTA's. 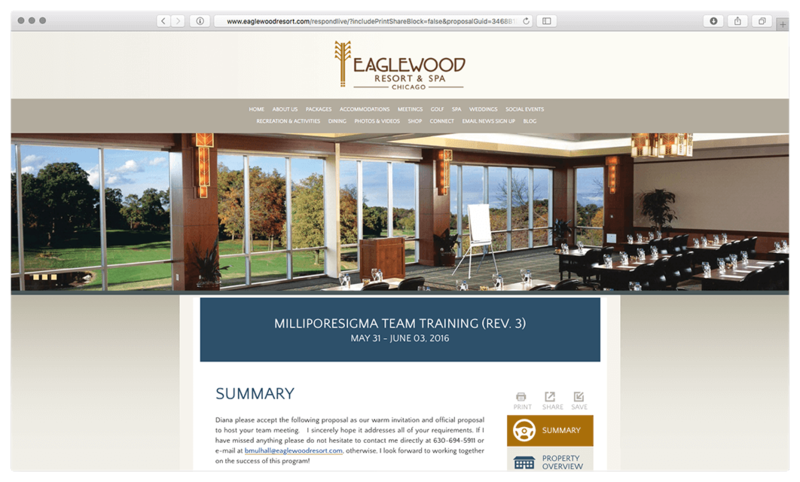 All of our websites are either fully responsive or we offer a standalone mobile solution. We set goals prior to commencing and include custom Google Analytics for every solution so that you can track and prove conversions. We maximize scope for every hotel budget. 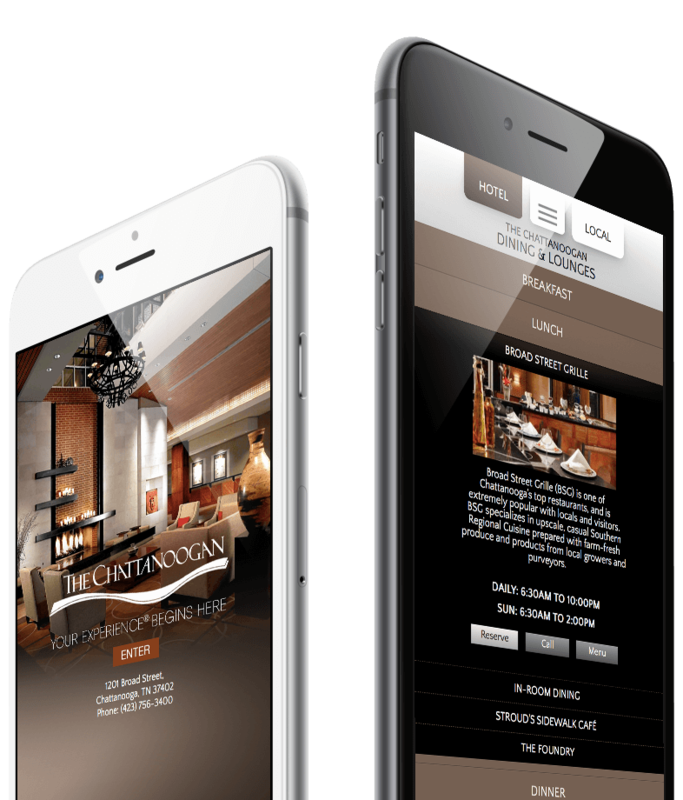 We provide fully-customized and design-ready responsive websites created for optimal user experience and engagement for the hospitality industry. It has become a "users" market, making mobile and tablet devices the first place your guests look. Interactive Sites has been providing award-winning websites for the hospitality industry for nearly 23 years. Our design, technical and marketing expertise, coupled with our deep understanding of the hotel industry worldwide, has allowed us to remain an industry-leading agency for decades. Given the many different technologies, devices and third party linkages, we have developed multiple approaches to present your hotel to guests, incorporating industry-leading standards as they relate to design, development, and management. Regardless of the path chosen, our customers are consistently thrilled with their results. We provide award winning fully customized and design-ready responsive websites created for optimal user experience and engagement. A balance of emotion, usability, business goals, content, your availability and budget. Mobile and tablet devices are key. With our product, HandsOn™ CMS. Highly extensible, they can be modified to meet your business requirements. We can also build custom applications to suit your specific needs. Highly functional, enterprise-level solutions that are designed to meet the specific business needs of your brand. 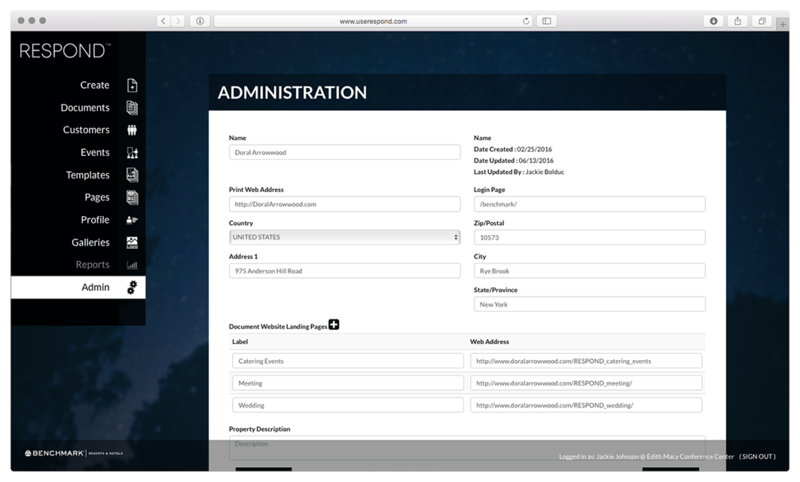 are configured, managed, and maintained by Interactive Sites IT staff. we provide are: Proven Track Record, Redundancy; Network Management, Threat Control, Disaster Recovery, Performance & Analytics. of a website is fairly quick, with an average estimated build period 3-6 weeks. Thank you for your interest in our website services and Reveal™. Fill out our quick "Contact Us" form and we will be happy to email additional information about our products and services. Including many major brands as well as several management companies, today Share™ is currently being used as a cross-selling and lead distribution platform by more than 10,000 hotels worldwide and has over 25,000 active users. More than $800 million of group business is consumed/actualized per year among our customer base with an estimated $5 billion in total circulated lead value potential on an annual basis. Share™ expedites the distribution and delivery process of all group business leads within a scalable and secured online environment and facilitates the closing of the lead while exhausting every opportunity to book the business within an entire hotel company's portfolio before turning away the lead. Share™ is a web-based lead distribution, referral and tracking platform that encompasses all aspects of the group lead management process. Share™ enables your entire sales operation including property, global sales offices or satellite sales offices to distribute, share and centralize all lead activity throughout your entire portfolio of properties. Share™ allows individual hotels to share group leads with affiliated properties, earning revenue on otherwise lost business. Share™ enables integration with other key customer support applications such as an existing company intranet, property information database, CRM or property-based group sales & catering systems and other lead database systems. Share™ provides an online RFP solution that can be placed on your brand/property website in order to centralize and distribute inbound website leads and RFP's. Share™ reports and tracks all sales volume, incentive tracking and contact and account management. Thank you for your interest in our cross-selling and lead management platform - Share™. Fill out our quick "Contact Us" form and we will be happy to email additional information about our products, pricing and services. A better way to create, manage, present & track your online proposals. ...and your customers see a responsive, custom styled proposal, right on your website. Many full service hotels in today's online environment are using some type of an automated electronic / online proposal solution to respond to planner's inquiries for group business such as meetings, weddings and social events. Unfortunately, the majority of today's electronic proposal solutions are inadequate, lack brand consistency, have restricted layouts and limited configurations, are hosted and managed by a third party and viewed in a third party environment, and lastly, not always costï¿½effective. Interactive Sites has combined their 22 years of success in building award-winning design and online solutions with their extensive knowledge of the "groups and meetings" industry and has developed a new product called Respond™. Provides a cost-effective and scalable "document management system" that can be used by all participating properties within the portfolio to conduct business and respond to inquiring event planners in a consistent manner in an online environment. Offers each individual property a co-branded proposal tool that is easy to use and creates a standardized approach to securing more group & event business with a professional level response. Provides a secured online environment for every participating property to have access to create, manage, and deploy electronic proposals. 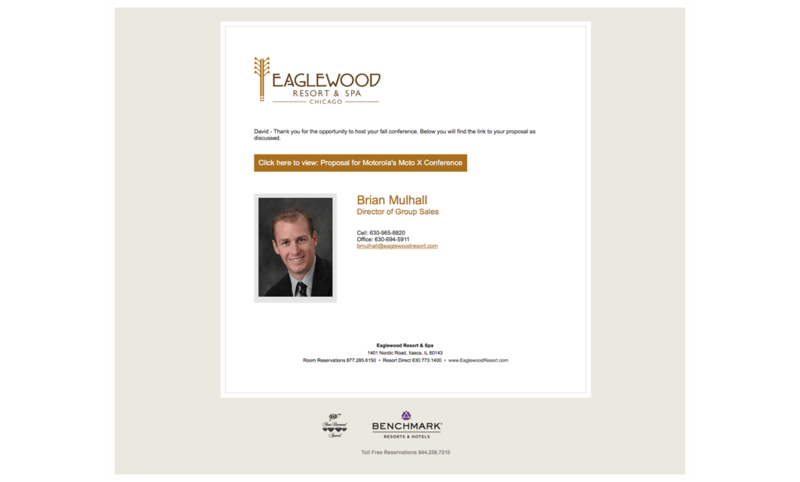 Provides a set of tools for hotel sales managers to create proposals leveraging existing content as well as to have the ability to create and insert custom pages within their proposal response. Provides a set of tools to measure and track proposals' movement throughout the buying process. Provides the planner with a secured access to view a proposal. Provides the planner with a seamless view of a proposal within the hotel's website. Provides the planner with a rich, content filled, visually fulfilling proposal. - The responsible party has the ability to build a new or update an existing document by following a simple workflow provided in the "Create" tool. 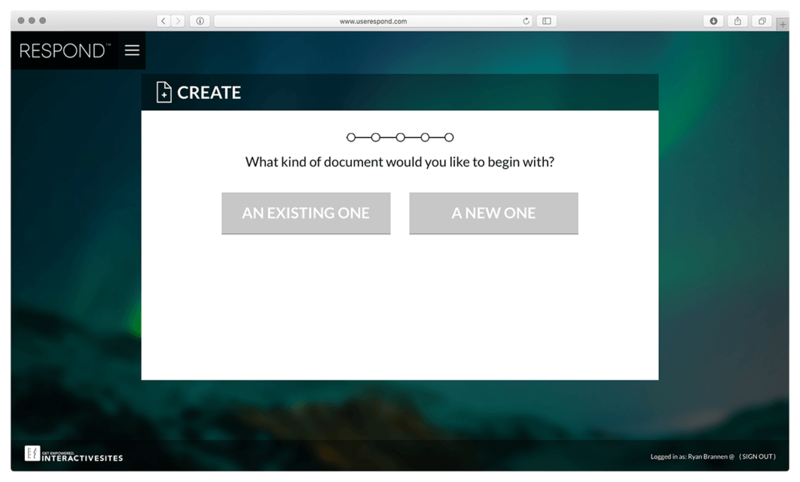 Additionally, each section of the "Create" tool can be accessed directly. - The property is provided with preloaded proposal templates which can be immediately used, modified, and customized. 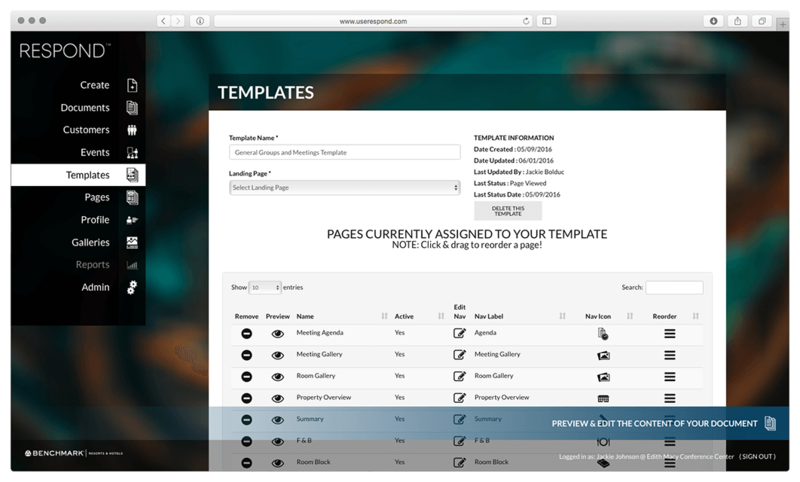 The "Template" tool is a repository for the templates available to the user. - The property admin / sales manager has the ability to create different galleries which can be added to the proposal / marketing document being built by the user. 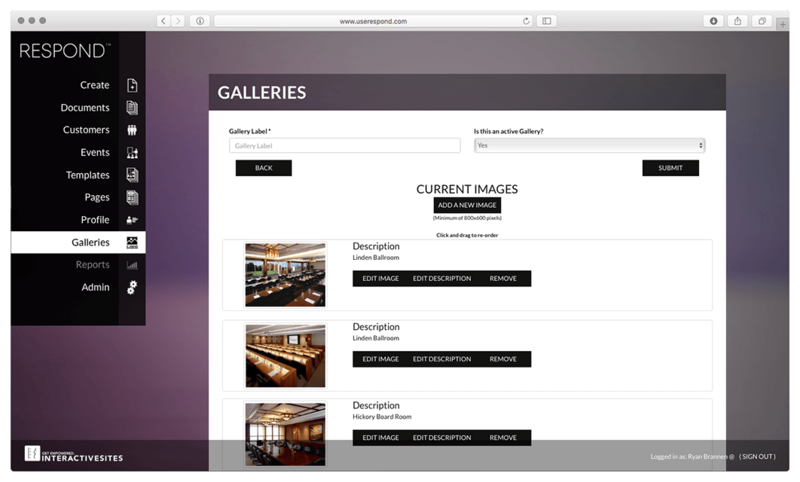 The "Galleries" tool is a place where all the galleries are stored. - The property admin / sales managers will have access to document tracking and reporting via the "Reports" tool. Each proposal is designed leveraging the individual property's current colors, branding, and graphic standards - all structured within a consistent template that will be used by all participating hotels. The event planner is provided access via a compelling template driven email message that will contain a link to the proposal. Notifications are sent to the event planner when their proposal is ready to be viewed. When the link in that email is clicked, another notification will be sent to the Sales Manager. Notifications will also be sent if the planner downloads, shares, or prints the proposal. Respond™ is compatible with Interactive Sites' - ShareIt Online™ and has been designed to accommodate third-party integration for sales & catering platforms and CRM applications. The delivery of Respond™ is fairly quick with an estimated at 10-15 business days and a formal project schedule and start date is provided after receiving a fully executed and signed agreement. Thank you for your interest in our new online proposal and document solution Respond™. Fill out our quick "Contact Us" form and we will be happy to email additional information about our products, pricing and services. Experience® is accessible via the internet and has been specifically designed for today's variety of smart phones and their respective browsers and operating systems for easy and quick access. 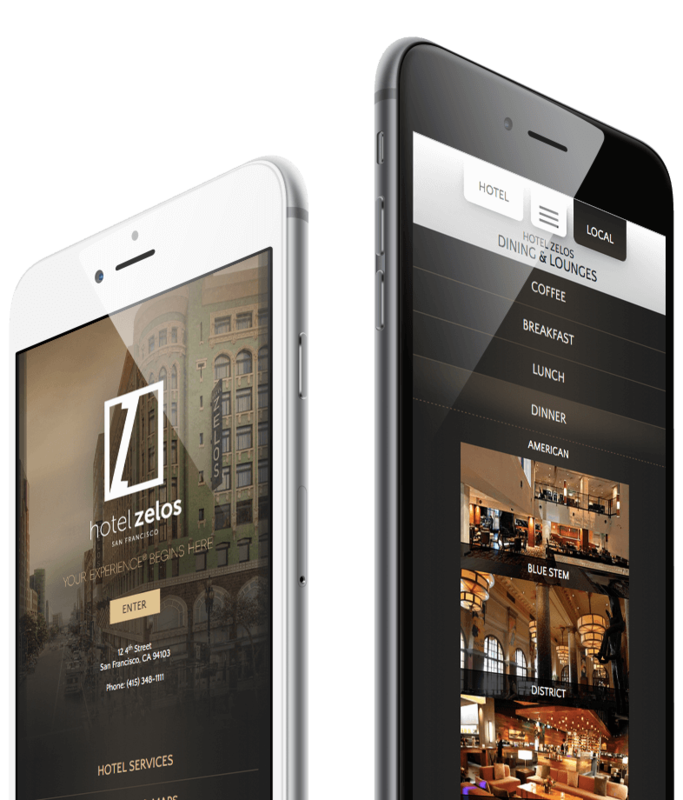 Experience® provides the guest with mobile access to hotel services, location maps, hotel and local restaurant outlets and local activities with the ability for guests to be informed every step of the way. Today's travelers are relying more and more on their personal devices and mobile phones during their hotel stay. 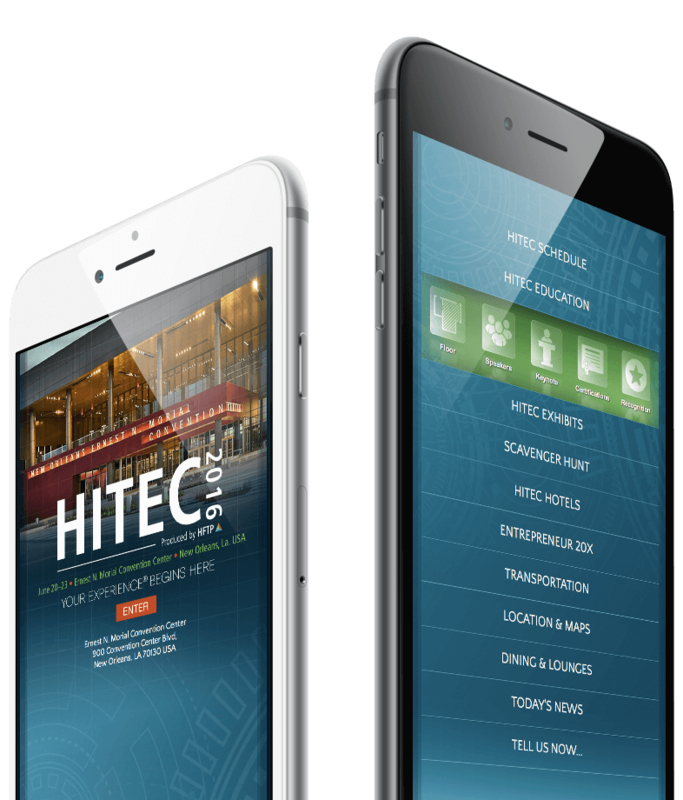 Interactive Sites' mobile solution Experience® provides the guest with mobile access to hotel services, location maps, hotel & local restaurant outlets and local activities with the ability for guests to be informed every step of the way. Experience® is available accessible via the internet and has been specifically designed for today's variety of smart phones and their respective browsers and operating systems for easy & quick access. When this section or navigation bar is touched it slides open and exposes the services icons to enable a direct phone call to the desired hotel service by simply touching the icon. Experience® presents dining and lounge options both on and off property. When a guest is searching for dining, 99% of the time they are searching for a particular meal based on the time of day or their scheduling needs; therefore we recommend categorizing by meal type if the hotel has more than 3 dining outlets. Highlight the property spa, golf course and other attractions to promote on-site activities. The "share" feature allows the guest to select the social media channel and share information regarding their stay and/or just write a nice compliment to the hotel directly. The "solve" feature allows the guest to connect with a manager related to the area of concern and communicate their issue so it can be quickly resolved. The "suggest" feature allows the guest to freely make a suggestion of either an improvement or a "thought you should know" type comment. The hotel can post guest specials at any time for any service. For example, if the property has availability at the spa this evening, an administrator can quickly add a special to promote last minute bookings. 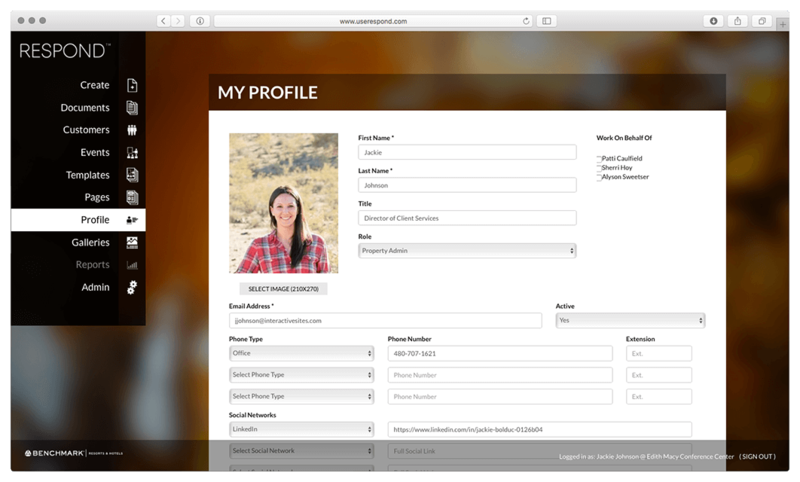 The guest can drag and zoom on the property map to locate either their location or another venue on property. When the guest selects on the navigation bar, it expands to display the transportation choices. Some icons are direct call opportunities such as valet or cab. Third party rental agencies or train schedules are links to the vendor's mobile site. The "local" restaurants and lounges listed are only the venues that your hotel has provided and is willing to recommend to enhance the quality of your guests' off-property experience. All restaurants and lounges are provided a standard listing, which includes a phone number, address that's linked to Google for directions and a link to the restaurant's website and/or mobile site if they have one. 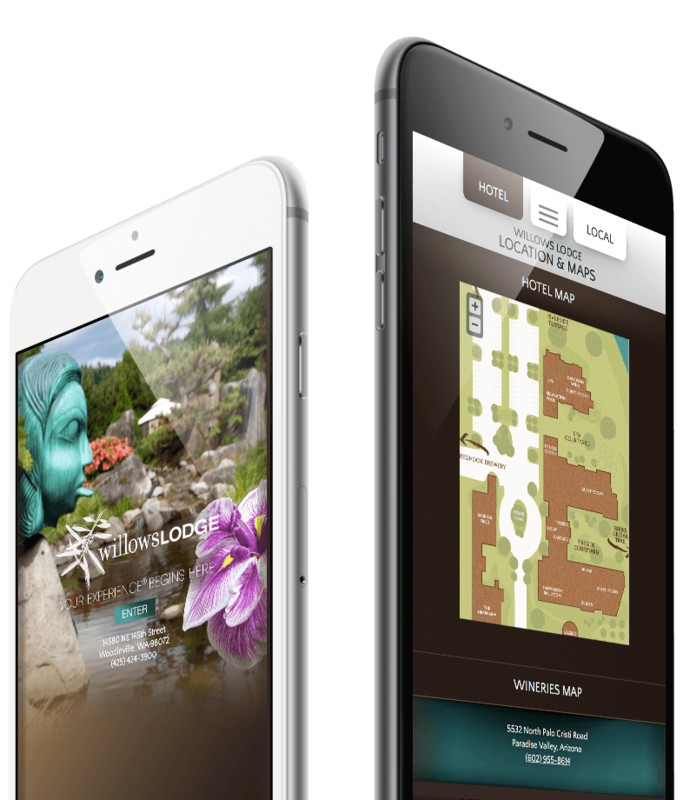 Connect your guests with your hotel's favorite local vendors and attractions and enable guests to experience your destination. When your hotel guest is attending a social event, meeting or wedding, they can simply log-in with a password provided by the hotel or their event coordinator to see all information related to their event (e.g. agenda, speakers, meeting space map, messages, group specials). Experience® may contain links to both third-party downloadable Apps as well as third-party mobile-friendly websites (suggested apps) related to such items as transportation, food & beverage, things to do and location specific, etc. The delivery of Experience® for individual hotels is fairly quick with an estimated at 3 - 5 business days. Fill out our quick "Contact Us" form and we will be happy to email additional information about our products, pricing and services. We started in the TECHNOLOGY SPACE by providing CD-ROM's to hotels in 1993, before being one of the first to harness the Web for our clients. We now have 22 YEARS of solid experience creating online solutions for the hospitality industry. We provide LEADING MARKETING AND TECHNOLOGY SERVICES to the hospitality industry, increasing brand awareness, room and group revenue, and promoting hotels throughout the online environment. We are CUTTING EDGE, developing new products for our own needs, and the ever-changing needs of the hospitality marketplace and our customers. We are HOSPITALITY FOCUSED with a diverse portfolio of clients: Over 11,000 Hotels & Resorts, 41 Brands, 8 Management Companies, 5 Industry Partners, and 2 Wellness Spas.